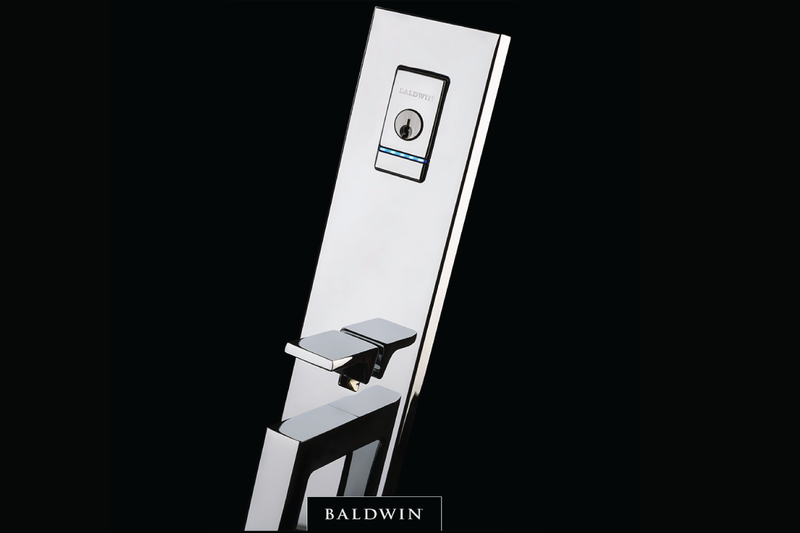 Baldwin Evolved is a premier collection of door hardware that delivers an electronic solution to exceed luxurious architectural standards. 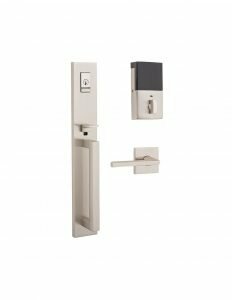 Powered by Kevo-technology, the Evolved collection is the next generation of smart lock technology handlesets and deadbolts. Evolved is extremely secure, both digitally and mechanically. It uses multiple levels of encryption to increase digital security, and is continually reviewed by industry-leading digital security experts. Evolved allows users to easily open and close doors via their smartphone and the Kevo mobile app which is available for iPhones 4S and above and select Android devices. The easy-to-use app also provides eKeys for remote access, real-time access history and remote unlocking abilities. Key fobs are available for entry without a smartphone. While maintaining beautiful aesthetics and upholding iconic style, Evolved’s streamlined design easily conceals the technology in a smart, sleek interior design that is 60 percent smaller than other electronic products on the market. By leveraging Bluetooth technology, Evolved offers an easy touch-to-open solution in 18 handleset styles, three deadbolts, and four interiors. Customers can choose from 18 Baldwin finishes for customizable look. Customers can also bring Evolved to life on their own front door with Baldwin’s new augmented reality app. 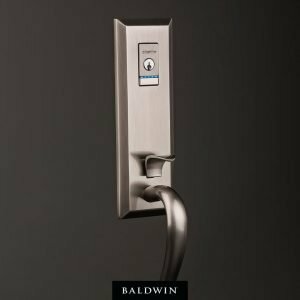 By offering Baldwin Evolved, builders and contractors can be industry leaders by providing clients with the latest innovation of hardware in the market. 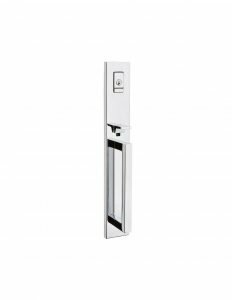 Evolved is a premier collection of hardware that delivers an electronic solution to exceed the luxurious architectural standards of customers. With Evolved, builders and contractors can incorporate a product into their project that is both aesthetically beautiful and extremely secure, both digitally and mechanically. Evolved uses multiple levels of encryption to increase digital security, and is continually reviewed by industry-leading independent digital security experts. 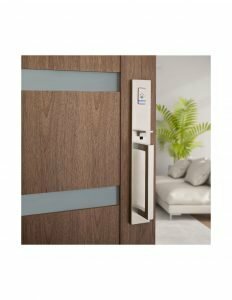 A unique advantage for builders and contractors is that Evolved has been selected by Lennar, one of the nation’s largest builders, as the door hardware and smart lock provider for the world’s first Wi-Fi CERTIFIED™ home designs featuring integrated home automation and voice control with Amazon Alexa. While maintaining beautiful aesthetics and upholding iconic style, Evolved’s streamlined design easily conceals the technology in a smart, sleek interior design that is 60 percent smaller than other electronic products on the market. 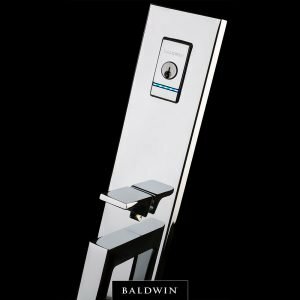 Evolved, an electronic touch-to-open solution, was designed to exceed the luxurious, uncompromising architectural standards of Baldwin customers. Being the ultimate in style and technology, Evolved provides a blend of convenience and beauty for customers. Evolved allows users to easily open and close doors via their smartphone and the Kevo mobile app which is available for iPhones 4S and above and select Android devices. Not only can users conveniently access their home but they can easily issue eKeys to friends and family for remote access while keeping track in real time of who comes and goes. Customers can choose from 18 handleset styles and 18 Baldwin finishes to create a customizable look for their home.